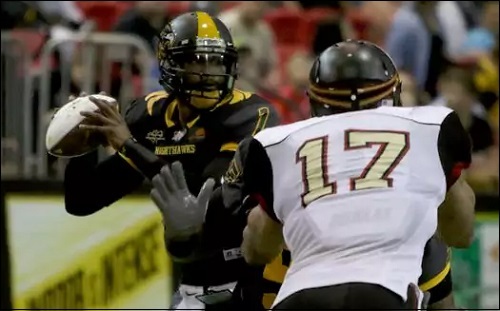 Charles McCullum completed 83 percent of his passes and threw seven touchdown passes as the Wichita Falls nighthawks opened their season with a 68-53 win over the Iowa Barnstormers. The Nighthawks scored on a four-yard run from Tyler Williams and on a five-yard pass from McCullum to Troy Evans to open up a 47-31 lead at the 1:15 mark of the third quarter. The Barnstormers would never get within more than eight points from that point forward. After The Barnstormers trimmed the Nighthawks' lead to 61-53 in a 25-yard pass from Travis Partridge to Brady Roland with 52 seconds to go, McCullum put the game away with a one-yard run 22 seconds later. McCullum, who threw touchdown passes to five different receivers, threw for 235 yards and ran for 25 yards. Williams ran 10 times for 37 yards and two scores. Phillip Barnett caught seven passes for 48 yards and three touchdowns. Jordan Jolly had five receptions for 78 yards and a touchdowns. Evans and Tyron Laughinghouse each had a touchdown grab. Kenny Veal and Michael Green led the Wichita Falls defense with seven tackles apiece. Partridge completed 20 of 40 passes for 303 yards and six touchdown passes. He also rushed seven times for 38 yards and a touchdown. Roland caught seven balls for 134 yards and three scores, while Ryan Balentine had seven receptions of his own for 75 yards and two touchdowns. Lucas Hefty recorded 4 passes for 47 yards and a score. Javicz Jones led Iowa with 10 tackles and Ra'Shawde Myers recorded a sack. The Nighthawks (1-0) are back in action on Feb. 25 when they visit the Nebraska Danger (1-0) for a 5:05 p.m. (pacific) kickoff. The Barnstormers will visit the Arizona Ratters on Feb. 26 at 3 p.m. (pacific). Both games, as well as all of the leagues games this season are available for streaming on the IFL's Youtube channel. I would have gladly watched the game but the stream quality was terrible. I think it will get better.